Ok, my first blog. My intention is that these are at least monthly as part of my strategy to write this novel by setting goals and deadlines, but if you find it useful or interesting too then this is also good. 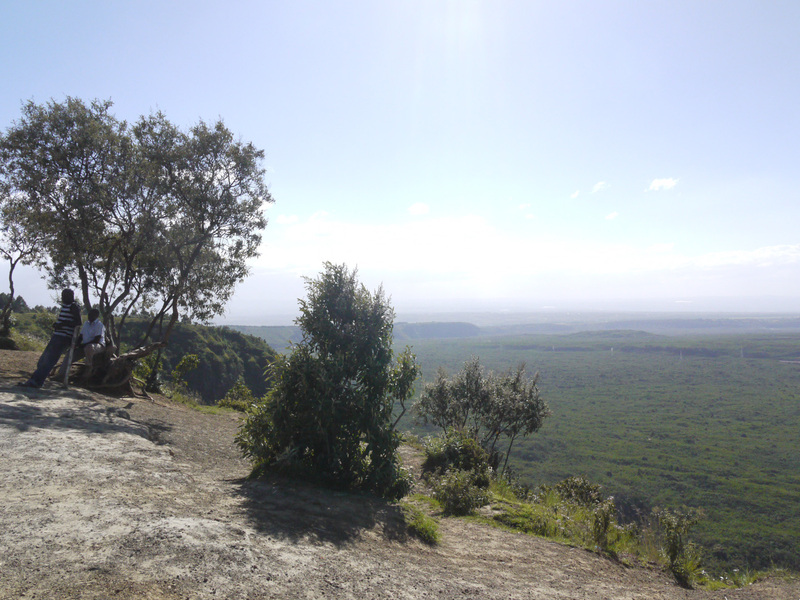 I’ve completed the log of my Kenyan quest to find a remote farmhouse on the slopes of Mt. Elgon on the Kenyan Ugandan border. The journey is seen through the lens of a somewhat distant personality from the past, my grandmother, and her life. I see much of this log as back-story to weave into the book. The story is also my journey – the people I met, the ‘then and now’ environment, the smells and sheer fun of the detective work. The detective work has continued: (1) The search could have been narrowed down if I had known that the owners of KK in 1962 were the Kerrs, that farm had become a dairy and that this dairy had since burnt down including the trees. (2) The letters make more sense. Of course she does write in shorthand because her father knew the context – as do I now I have been there – eg I now know that 1820/1 is a land registry number. (3) I also heard from Orie Rogo Manduli, who texted the history of her farm and provided another piece in the jigsaw. She also has promised to get me the title history of other farms. Unfortunately much of the new information is back-to-front and received after I needed to know it. I knew this was a much used device to create suspense and storyline in ‘who dunnit’ fiction, but I now know it is the everyday experience of detectives. Background reading goes on apace. I’m reading. The current books are Karen Blixen’s Letters From Africa 1914 – 1931, CS Nicholls Red Strangers and Julian Huxley Africa View. I want to shift the distant lens to include the close up lens of today and coincidentally a friend sent me an article on John Quincy Adams by James Traubmarch. In the article Traubmarch considers the relevance of Adams today and his different moral stance based on Plato and Aristotle, and a fixed cosmos — compared to our philosophical outlook today underpinned by Darwin and Freud. After spending five years researching Adams for his book, Traubmarch concludes that Adams wasn’t like us at all. We don’t want to know what Cicero stood for to help us decide what we should stand for. We want to know what Cicero was like and what shaped him. This set me thinking. The difference between a British Edwardian woman and a modern woman isn’t just the solar topee and clothing. It isn’t that one of them doesn’t say ‘okay’. It’s that they think differently to us today. Even such basic things as the perception of distance and the size of the world are different. If you wanted to get to Mombasa by sea in 1924, it took three weeks, via the Suez Canal or longer round the Cape. Astronauts to the Space Station orbiting the earth take 10 hours to get there (and hours to actually dock) and the Space Station takes 92.69 minutes to orbit the earth. Next month I intend to develop this line of thought further and consider free will, fate and identity. The further we go up this road, the more the poverty. Martin is shocked that Kenyans still live like this – women and children collecting water in Mutumgi (jerrycans) beside cattle drinking the same water. Primary school children are playing on a small bare earth playground beside a mud-built school. I see only brick buildings sponsored by safari.com and Coca-Cola, all the rest are traditional mud houses standing under trees surrounded by straw-coloured grass. The rainy season, called the long rains, are due to start in about four weeks. There is a glimpse of crops in the shamba at the back of the photo and the people look well-fed. The road is black-top up to Endabess, but then red Murram. This is not good news, we are late for the meeting. Martin drives faster. On some parts of the road, the road has a steep camber on both sides of its pebbly pitted surface so a preference track has of course emerged which all cars and Matatu (minibus) use – vehicles coming from both directions. If the preference track is on the ‘wrong’ side of the road, we lurch across at the last minute with the car pitching and bucking as if a ship on choppy water. A red dust cloud burls down the road towards us and turns briefly into a Matatu as it passes us and is swallowed back into dust. Inside the bus I glimpse grimy people lurching like red anthills dancing. Martin grabs his phone to take a photo. “My friends won’t believe they still have Matatu ‘face me’s’ here.” The name describes the seating arrangement perfectly. This is not a great idea, Martin needs both hands to hold the car, so Colin says: “You drive, I’ll take the picture.” Another ‘face me’ swoops at speed behind us, swaying drunkenly. There’s a man on the roof luggage – incredibly he’s waving at us. Three kilometres from the Uganda border we reach the rose farm to meet long-term settler, Bob Andersen. My grandmother had all her roses grown by his grandfather Robert Akele for her horticultural business. Roses were his specialty. Bob gives me a catalogue from that time detailing dozens of roses for sale – as well as fruit trees. I have catalogues of my grandmothers dated 1936, 1937 and 1938 with a large section on roses to0. They are probably his. The parallels of Bob’s Swedish grandfather Robert Akele time in Kenya and my grandmother’s are strong. Both came from famous horticultural families: my grandmother from Sutton Seeds and Robert Akele from five generations of famous horticulturists farming 1000 acres in Jonkoping, Sweden. They both chose their farms at altitudes around 6000′ – 6400′ in the Trans Nzoia because it has an ambient daytime temperature of 26 C – 28 C all year round and fertile volcanic soil offering a near perfect environment to grow fruit, roses, coffee, maize, pyrethrum and vegetables. Also the summer in Sweden lasts only three months. Robert Akele came with 45 different plants from Jonkoping and Emilie May was sent bulbs and seeds from Suttons Reading as well as Suttons India in 1920’s. They both sank their money into their venture, and like everyone else at the time, they all lost it all. In the early days settlers were optimistic that fortunes could be made; coffee and maize prices were high – it seemed no one could lose. Robert Akele was one of those first settlers when The Kenya Colony was considered the destination for people with initiative. By 1923 he was propagating and exporting 60,000 roses. He was innovative and a visionary. He went to California and Mexico and brought back avocados, Fuerta and Pueblo, wrapped in hessian gunny bags, watering them all the way back to Chepata Farm. In the 1960’s and 1970’s they were the cash crop on the farm. Not everything was successful, he sent a drum of passion fruit to London and Sweden in 1930 but was told they would never catch on. The 1920’s were the good years, then came the Great Depression in the 1930’s, plagues of red locusts flew over the land and the rains failed in some years. Prices halved for maize and coffee. Coffee rust saw 2000 acres of beans drop to the ground. No one had any money for roses. Most farmers went bankrupt and left, but Robert Akele sold the Swedish farm. Surely things could improve – but they didn’t. Drought came in 1953, destroying 1000 acres of wheat and maize. He lost everything. It broke Bob Andersen’s grandparents and his father inherited the farm. By 1960 the roses were grubbed out and avocados became the cash crop – which was successful until South Africa emerged from sanctions and subsidized farming. Robert Akele and Emilie May were years before their time. Not for them the modern access to markets and refrigeration, they were at the mercy of hail, disease and locusts – quite apart from the world commodity price collapse. They were though quite right about the soil, the altitude and the climate – except that Bob told me that KK was in a microclimate hail belt of Mt Elgon. Nine decades on, roses again bloom and avocados ripen on the tree on the Andersen farm. Flowers picked in the morning can be in the great Amsterdam flower markets within 24 hours. Roses, fruit and vegetables have become big business in Kenya with huge greenhouses, with misting systems and protection from the midday sun, block views of Lake Naivasha. Settlers like Robert Akele and Emilie May had made this possible. They stumped out the trees, they built the murram roads, lived in mud huts while their houses were being built. And crucially, they put in their money, passion and hard work to try for that perfect bloom. 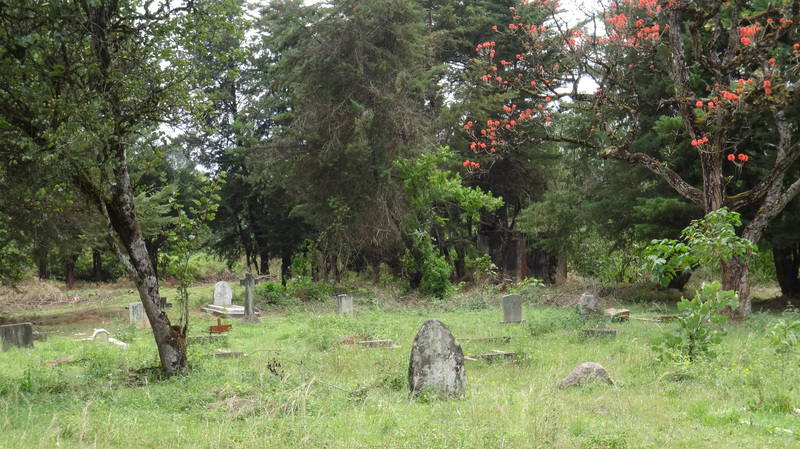 Today I went to pay my respects to Gertrude Mary Kuhn – an Edinburgh lass and nanny to my mother and her two sisters – who is buried in the old cemetery in Kitale. She died on 18th September 1929 and was buried here at 5:30 pm the following day. My grandfather paid for the funeral and the headstone, but neither he nor my grandmother were able to come to the funeral because the authorities were still questioning them. We did not know how to find the cemetery but a red-jacketed Boda Boda motorcyclist did. We followed Red Jacket and his girlfriend who swayed decorously, perched sidesaddle behind, while texting. We headed north. The town turned to shanty on one side and a eucalyptus plantation on the other – this cannot be the right direction, we were now five miles out of town. Martin waved his hand out the window and Red Jacket pulled over – Yes, he knew of another cemetery. So we headed back into town, dropped off girlfriend and went through the maelstrom of the town and out the other side – to the Commonwealth War Graves! We pay off Red Jacket and decide to use logic – the Settler’s cemetery would be in consecrated land beside oldest Church in Kitale, wouldn’t it? We head for Anglican St Luke’s Church, the oldest according to Wikipedia. Logical but wrong. The foundation stone for this church was not put in until 18th March 1929, fully 10 years after my grandfather arrived with the District Commissioner Champion. Settlers needed earthen homes before then. Martin asks again. Same instructions; so we retrace our steps and head north. After six miles and another enquiry we turn into a narrow lane and pull up by a stone arch leading into a rectangular grassy area with tombstones. There must be a reason the settlers chose this place for their loved ones here, but that is not apparent now. The settlers were already so far from home and this unkempt rectangle was even more remote even then. And there is no church of any denomination nearby at all. Graves from 1920’s were a small number with British, German or Boer names so presumably from different denominations therefore the eternal rest had to be irrespective of race or creed – but not colour, that barrier was not removed until after independence in1963. Four decades later, the 1960’s Settlers graves map could only name Gertrude Kuhn’s grave amidst other unnamed graves. Nine decades later, I could only find the general area using the photos taken last night of that map.Her grave may not be identifiable but as long as we remember her, she lives on. Many of the gravestones are toppled face down and therefore unreadable. The quiet earthen homes are untended, the grass is long, the trees sparse with flowers. The fruit of their loins are flung far to prosper far from this place where their kind is welcome. There are few left to care or remember and seemingly none to cherish these ancestors. Indifference and time are erasing these people buried very far from home. A man is employed to look after the cemetery and he trails after us, curious as to why two foreigners are looking at each old gravestone at the unfashionable far end of the cemetery. Newcomers to this commune of souls crowd in the area nearest the car park; their red mounds affront, like slashes between the green old graves and the pathways between. It’s a puzzle quite why these newcomers are forced on the older inhabitants, because the cemetery has plenty of space on the far side in an identical rectangular space, but only two graves, neither recent, lie there with a track beside. Today we went to stay the night with long term settlers the Barnley’s – Jane Barnley in her 90th year and son Richard who’s Colin’s age. 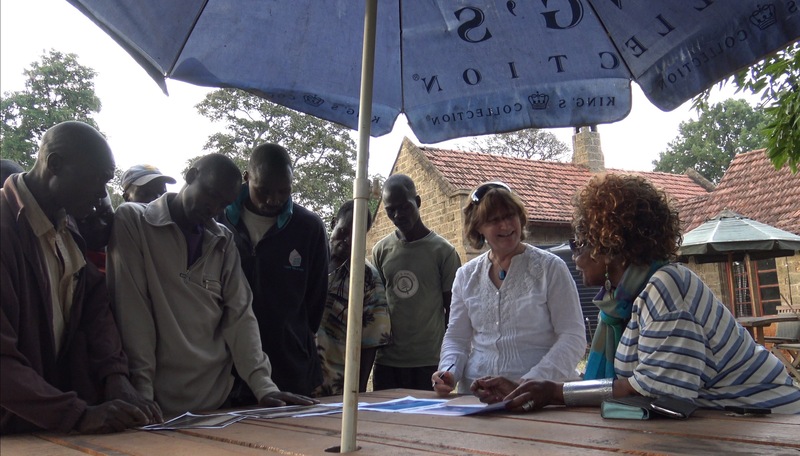 There must be something in the Kenyan water because Jane and Sylvia Davidson are remarkable for their age. I had been hoping that Jane would remember my mother and Valerie since they were the same age. They are unlikely to have known each other in Kitale because Jane lived 23 km north of Kitale and my mother and Valerie lived 22 km to the South West of Kitale – all three went to Limuru Girls School and were therefore presumably in the same class. Alas no, it’s too long ago. The Barnley’s lovely old bungalow is set in five acres of garden near the Cherangani Hills with mature native trees and five colobus monkeys, a breeding colony with a baby. These beautiful monkeys have nowhere else to go because all native habitat has been destroyed between this haven and Saiwa National Park 5 km away. There is a direct consequence from this destruction for humans. Richard said that they had sold a sweet water spring with land adjacent to their house, and the new owners had cut down the native trees. The spring dried up so they planted quick growing but thirsty Eucalyptus! The spring came back but as a small trickle. It seems so obvious: no trees = reduced rain = springs dry up. The Brazilian photographer Sebastião Salgado made the connection and planted back part of the Atlantic Forest in Brazil which brought back rain to the drought stricken land. How long will it take before the penny drops elsewhere? During tea in the Barnley’s cosy sitting room with a lit fire – this may sound strange, but it is 6000′ here and when the sun goes down there is a nip in the air – Richard said that the bread and butter of his guesthouse business is returning settlers or descendants trying to find their roots. 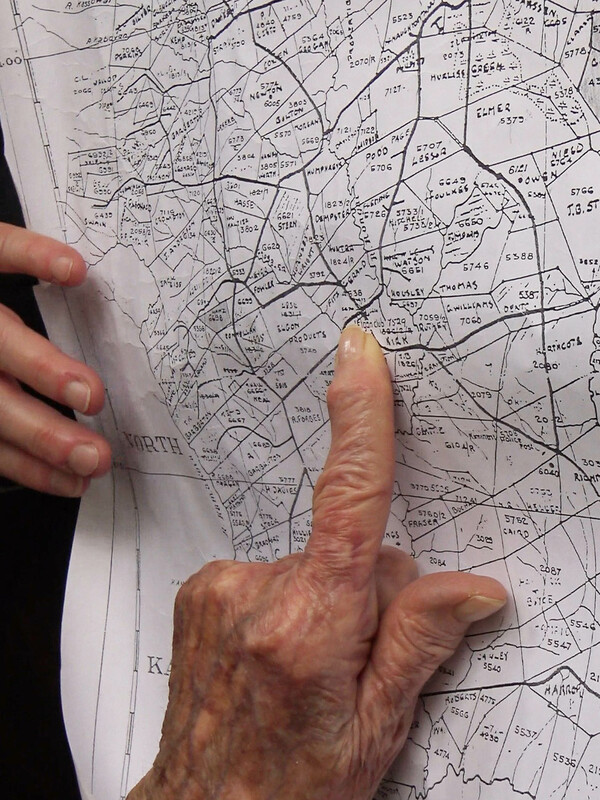 He keeps copies of the land survey map – the same that Sylvia Davidson had had with the names against block numbers – and we gratefully bought one for a small fee. This will be a great addition to help with the quest. 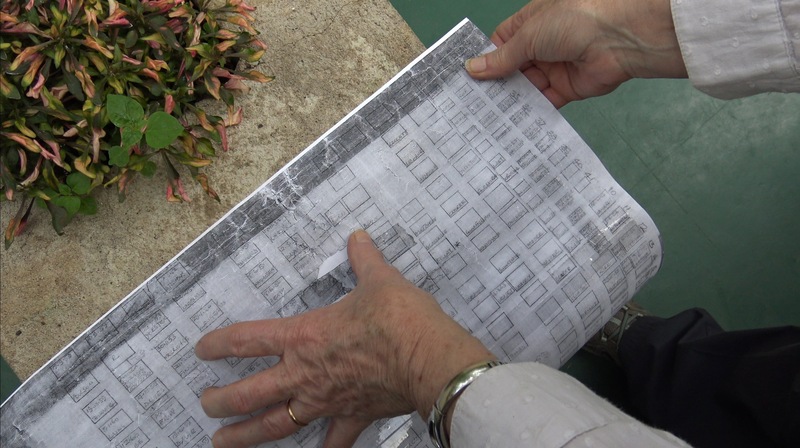 Richard also had a 1960’s map of the settler’s graveyard from the beginning of the twentieth century. Not surprisingly the oldest dates were in the middle at the top end. Some of the names were missing but there was Mrs Kuhn – without her first name or date of death but recorded and therefore remembered. The photo above is of this map pointing to Mrs Kuhn’s grave site. I added the date of her death, 17th September 1929, onto Richard’s copy and Colin took a photo. Poor Mrs Kuhn, the children’s nanny, killed thinking she was a leopard. The circumstances so odd that it seems probable the poor woman had gone a bit mad. Mrs Kuhn had arrived on 4th January 1928, my mother and her twin Valerie’s second birthday. Her arrival marked the end of a desperate search to secure a nanny – a French and an Irish nanny had not worked out at all. The former had taken one look at the house, without any electricity and isolated, and refused to stay, the latter was unable to discipline the children to my grandmother’s satisfaction. Subsequently an English nanny with passage paid had found a husband in her boat out to Mombasa and broken contract. Establishing the farm took all the energy of my grandparents and, in any case, Edwardian ladies did not do child-rearing. Mrs Kuhn had been interviewed and contracted by my great grandfather, Leonard Sutton who had also paid her passage. Her arrival was greeted with great relief and my grandmother left the following weekend for Uganda with ladies from the Kitale Club for a get together in Entebbe, Uganda for a week. Despite living with this longed-for, indispensable woman in a small house miles from anywhere, to whom she entrusted sole charge of her three very young children when she went away for breaks, she never referred to her by her first name, it was always the formal ‘Mrs Kuhn’. Later I found that her name was Gertrude Mary Kuhn from an official Notice in the digitised on-line Kenya Gazette Archives following Letters of Administration. Musing this, and with another piece in the jigsaw, we turned in. Tomorrow we’ll be up at 6 am to go to Saiwa national Park to see birds. My stay in China, which began in August l991, coincided with a period of crisis in the foreign community in Beijing. Shortage of suitable office space and housing were forcing rents to escalate. Serious although this was it was the acute lack of quality expatriate schooling which caused the main concern. I formed a group with two other like-minded people: Sabina Brady, a business woman with 10 years standing in China who provided the business/financial skills and Michael Crook, a British/Canadian born and brought up in China to advise and help with the Chinese bureaucracy. Our ambitious aim from the start in September l993 was to open a school called “The Western Academy of Beijing” on 1st. September l994. It was clearly the right move, initial corporate backing came from GE, Motorola and Shell. The Managing Director of Rolls Royce also joined in a private capacity. In September l993 I wrote a feasibility study for the Chinese authorities seeking permission to found an independent, foreign-run non-profitmaking elementary school in China. By Chinese law a school of this type would fall under the designation of a shiye or Social institution. At that time, all such institutions were Chinese run, funded and under a governmental umbrella. Securing approval for a shiye which had foreign independent ‘ownership’ and control, was specifically precluded under the laws governing social organisations and there was no precedent. The State Education Commission, Jiaowei were not sympathetic with our attempts to join with Chinese schools. •	Qiye (business) : While at first sight attractive being the usual method of business in PRC, it had drawbacks from the Chinese Corporate Tax requirements (Chinese corporate tax is paid on gross income) and problems with finding a sympathetic and silent partner (our school was to be non-profitmaking). To cover our costs and to fund a Chinese partner, we would then have to raise our fees to unworkable levels. We were determined to proceed with a shiye, despite the formidable odds of convincing the Chinese authorities to approve the formation of a new type of shiye given that there had never been a foreign shiye, nor indeed any foreign school outside of the diplomatic umbrella, and further it was counter to Chinese regulations. It required initiative and inventiveness to find a legal solution that would be acceptable to both the Chinese authorities and the sponsors of the school. Our solution was an Educational Trust set up in Hongkong which would provide the external legal identity to allow a Social Trust to be set up in Beijing. The Educational Foundation would be registered as a shetuan (social organisation) – even though the establishment of a foreign owned shetuan is also specifically precluded under the laws governing social organisations. By late December l993 we had established “The Western Academy of Beijing Educational Foundation” in Hong Kong. However, we still needed the Foundation recognised in Beijing by the PRC Ministry of Law. A way was found. A Notary Public in Hong Kong, accredited and recognised in PRC,notarised the Trust Deed. The Trust Deed was then taken to the Office of the Ministry of Justice of PRC in Shenzhen for certification. Armed with this, we could then get our all important seal cut in Beijing which enabled us to open Bank accounts write cheques and sign the lease for the school …. . It was now late March l994! Whilst the legal framework in Hong Kong was clear, the corresponding transparent legal framework in Beijing was not. At every turn we met with brick walls and there seemed no way forward to achieve our aim. There is fazhi (the rule of law) in China, but this is overlaid and intertwined by an older tradition: renzhi (rule by individuals). Both must be given equal weighting. Renzhi encompasses li (propriety, etiquette) and qin (personal relations – within proscribed and accepted form). It is the embodiment of the Confucian spirit. Renzhi has survived intact from the rule of the emperors and given as a legacy to the new communist rulers, this is somewhat analageous to the old feudal system in Europe, All power and authority emanates from the king (emperor) and filters down through the chain of power even to the factory floor. Every petty bureaucrat must be courted and fêted to ensure agreement to the venture. Li, qin and fa, in order of priority and preference are the way in which people think, act, resolve problems and deal with new phenomena. Historically fa was the least desirable route; carrying with it the threat of arbitrariness, strict liability and, in severe cases, death of the entire extended family. Li and qin were invoked to ensure that the circumstances and needs of the individual were taken into account. In present day China, guanxi (the use of personal relationships through favours given and received) is an extension of the traditional li and qin . It is used to gain advantage over rules of law which do exist: to gain an audience,to secure a contract. Guanxi is the cornerstone of successful business in China and the oil which ensures that the cogs run smoothly without obstacles from the bureaucracy. Since we did not have the requisite li or qin nor indeed the wish to ‘pay our way’ to overcome the desire of local government to flex its muscles we had no choice but to obtain approval at the highest government level. In other words to go to the centre and take the least preferred route, fa.Through support from The World Bank and 19 embassies we went to Central Government and asked for the personal approval and intervention of Li Lanqing, Vice Premier of China with the brief for education to allow us to be a legal identity, a sheyue. We were granted approval for the school on 27th January 1994. By a squeak we had our chance. By going to the centre we achieved our aim,we now had a mandate for ensuring our existence. We had used li and qin to secure fa (an important route for achieving objectives here in China), but the li and qin was that of the World Bank and not our personal li and qin. We still needed the school to be registered by Beijing Municipality Education Bureau (BEB) since all primary and secondary schools are the responsibility of local, not central government. Lack of li and qin ensured that they felt no obligation towards us nor relationship with us. BEB were mandated by the State Education Commission (the centre) to register us according to the law but they did not wish to do so. From their perspective we were wresting a favour from them without having gained guanxi and the long-term mutual obligation this establishes. This we now set out to remedy. We are now building a long-term li and qin with BEB. We had come up hard against the inherent contradiction of centre vs. regional. This is perhaps the hardest thing for foreign businessmen to understand: the conflict of centre/regional, fazhi vs. renzhi, the need to balance this and give benefit to the Chinese parties within a foreigner’s sense of ethics. This problem of centre vs. local is not only confined to central government vs. Regional but also at all levels of Chinese society: City vs. Bureau, Bureau vs. factory. After much negotiations we signed a 10-year renewable contract with The Beijing Textile Machinery plant for a school building complete with nursery, sports field and greenhouse. This contract was signed by the factory director during a very brief window of time when factory directors had the authority to lease out state/government property to resolve insolvency problems. The authority has now reverted to the centre and is now on the Bureau level. This has necessitated some contractual renegotiation. To compound our problems there are also a tradition of rivalry or power play between and among departments in China which ensures that all departments operate on vertical lines. There is no contact between the various departments of state except at the top. Even though we had been granted a right to open by State Education Authority we had to start over again with the Customs authority. In addition, we had been registered as a Chinese shiye with foreign ownership. Chinese schools are allowed all educational materials free of duty but they do not import the types or sophistication of equipment we wished to import. Intervention (li) from The United Nations eventually allowed our educational equipment to come out of customs: the last coming two days before the school opened! Notwithstanding all this, the Beijing Educational authority did register us. When the school successfully opened on September 1st. l994 it was opened by the acting ambassador of World Bank, Mr. Ramgopal Agarwala and by Li Shunxing, Head of China Education Association for International Exchange, The State Education Commission. Hu Zhaoquang, Vice Mayor of Beijing in charge of Education also toured the school. We had been accepted. The school now has 226 pupils under the aegis of Ian Rysdale, Headmaster and the educational help and support from The European Council of International Schools. The clarification of the legal status of the school in the PRC will be the result of retrospective legislation. Meanwhile the school is accepted, secure, successful and growing. To date we have not yet achieved all of our aim. The Educational Foundation has still not been recognised in PRC as a Chinese shetuan. We are not alone though in this endeavour; even the Ford Foundation with a huge annual budget has not succeeded in becoming a shetuan : they are currently registered as a qiye (business). We would still prefer to be registered as a foreign shiye and not as a Chinese shiye with foreign ownership. Retrospective legislation passed this March has given us a legal existence we shall achieve the rest when the powers-that-be become used to us. Are there any lessons in this for joint ventures in China? The growth of China has seen considerable stress on the infrastructure both in being able physically to set up a business and in terms of running a business. Like everywhere, in order for things to work out it has to be to both party’s advantage. In the West management talk about “win win” situations: China talks about seeking mutual benefit and cooperation. Successful ventures realise that the two sides are using different language to achieve the same aim but not from the same starting point. The foreigners prefer fazhi, the rule of law and fairness, as the basis for society, the Chinese prefer renzhi, the Confucian route based on relationships and contacts. The two are not mutually exclusive. To be successful in China a foreign concern needs to be aware of this and build relations with his Chinese partner while negotiating his contractual relationship. However, from a foreigners’ point of view it is heartening that corporate legal system in China is evolving. There is a recognition that stronger business law is needed to attract foreign investment. The China Securities Regulatory Committee (CSRC) is looking at the issue of corporate governance. If the rule of law held sway then the individual power holder would not matter, as there would be checks and balances to ensure any office or officer did not exercise abusive authority. The inherent historical aversion to invoking fa and the reliance on a non-legal system where li and qin hold sway must be overcome by the authorities if China is not going to be held back by corruption from her rightful place in centre stage. Within China we did not have the legal framework we needed to begin with but we did gain high level support. To use li and qin to secure fa is a time-honoured route in China. The good news is that the Chinese were pragmatic and were adaptable in allowing this venture to proceed as it was in everyone’s best interest. Using our school as its model legislation to amend the Social Laws governing Shiye and Shetuan were passed this March. Finally, in the twilight of the Deng era, it is interesting to reflect on his description of Hong Kong and mainland China coexisting as “one country two systems”. To the Western trained chartered secretary, the legal system in Hong Kong provided a comfortable and understood existence for the school that it is allowed to exist in, and be recognised by, The Peoples Republic of China while the Social laws to formalise our existence are in the process of being drawn up. Such a flexible existence is less comfortable to the Westerner but perhaps being “one school two systems” is an indication of how the maxim will be implemented and mutually beneficial ventures will be assisted to thrive. This evening after supper we went back to the photo of the Land Registration Map again to find the land registry numbers Orie had given us. My hand was over much of the map and the delineated area of Orie Manduli’s farm lay under my finger! I was emphasising where the Gantz farm was. As the photo had been freeze-framed from the video, Colin went back to it to see if there was a frame of the Map. There was – with Sylvia’s finger this time at The Elgon Club. Block 6135 Jack is where the Kama Koia River takes a pronounced bend right, J Anderson is clear north of it on block 6134. He extracted that frame as a .jpg and saw to the north of it — the name ‘Jack’ under land registry number 6135! To the north of the Jack acreage was the name J. Anderson on acreage no. 6134. The ‘Jack’ land must be Kama Koia Farm because in 1932 Emilie May wrote to her father that part of the acreage had been sold to Anderson. She also wrote that another neighbour was ‘Ratieff, a Dutchman, managing for H.W.Lane of the P.W.D’ — to the south-east is Block 5350 -Lane. This is amazing. The information had been there all the time under our noses but I was not looking for it. I had assumed that the map had been made post 1938 when the Gantz bought 500 acres of Kama Koia Farm and post 12th January 1939 when my grandparents, my mother, her twin sister Valerie and my aunts Sue and Monica left for England, never to return. Now I know where KK farm is, but maybe only a part of it. If 6698 was called Kama Koia Farm then it must have been sold by my grandfather as it must be unlikely that there were two farms of that name within five miles of each other. Block 6698 is separated from 6135 by the two Manduli blocks 5368 & 6832 – so presumably one, either or both blocks must also have been part of Kama Koia Farm and become subsequently detached. — If so, KK house site could be where Orie’s current house built in 1946 is. 1. December 1927 ‘Fred is doing business nearly all the time. He has sold the lower part of our farm KK to one of the Sutherland Bros who are our agents in Mombasa. 3. A.D Hartridge (bought a small piece from Tweedie – letter of November 27th, 1926). ‘Beyond the fence divides from a gum plantation and a windbreak from the Machewa Valley, Hartridge and Tisdale. 4. Col Trench, his wife was Miss Fidler of Reading, his farm touches KK at the back. What a pity, none of them are written in the other blocks around 6135. Maybe people we ask tomorrow, now we know where to resume the search, will remember, after all John did know that Priscilla lived in one of the houses — but I think she may have been more recent than 1926 – 1932. Maybe someone will recognise something from the photos from Aunt Sue and of KK house. We need to turn in. Tomorrow will be another long day eating red dust on bumpy roads. Robert is going home and his head driver, Martin, has driven up from Nairobi to take over. Today tested the car, I hope Martin is up to it. Today we are going to start the quest to find Kama Koia – the farm or the house built by my grandparents in 1926 of the same name, or just the site of the house since my Aunt Sue has warned that it had been demolished by the time she came here in 1962. 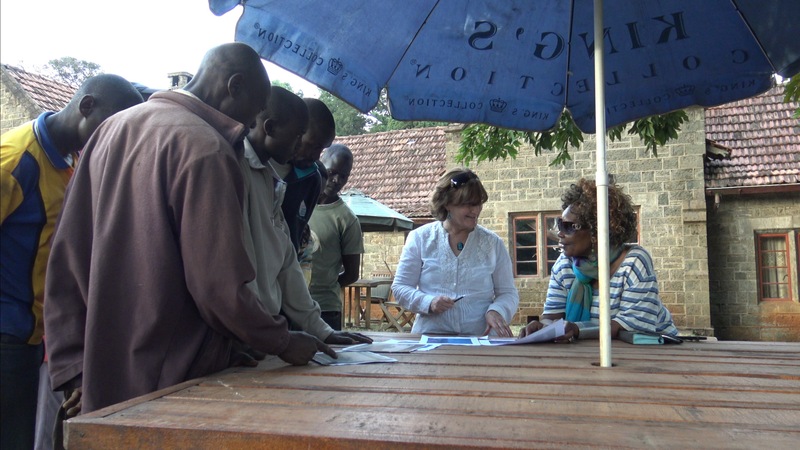 Colin has worked out GPS coordinates by freezing a frame of his video of Sylvia showing us a Land registry map and my grandmother’s sketch map – it’s schematic but has useful relationships in miles from KK to neighbour’s, the Elgon Club and Kitale. If we get to the right area maybe we’ll recognise something from some topographical clues of where KK house and farm which my grandmother described them to her father in his letters; or maybe someone will recognise the photographs of the house and farm and from my Aunt Sue’s visit to this area in 1962. 1. Fred Chater Jack bought Kama Koia Farm from Gordon Hewitt in 1925. The land as bounded between the Kama Koia River and the Machewa River. 3. A description: ‘Our house is not on land near the Kama Koia Farm which Fred is running with Arnold – but we have take a piece of land in the farm for house & garden. This will be our own and if the farm is sold [it] will be sold separately… [it] is approx. 6750 ft.’ Confusingly, both the house and farm were called Kama Koia. 4. The house is on a hill and stands five steps up from enough flat land for a lawn, herbaceous border, apple orchard and vegetable patch. There is no view of either river from the house. To the north, the view from the dining room is of Mt, Elgon. To the south, from the drawing room, the view is of the Nandi escarpment as a blueish haze some 60 km away. 5. A Swiss man, Mr. Gantz, bought Kama Koia Farm on the slopes of Mt Elgon in 1938 – a parcel of land numbered 6698 in the Land Registry – the same numbering system is used today for land registry. Each numbered area was/is 500 acres. Plot 6698 was likely to be KK (the company) and not the house, because Sylvia warned that there was no house on the land her father bought nor were there any sign of flowers or a horticultural farm with orchard and vegetables. 6. A photo of the land marked ‘Gantz’ with number 6698 of the Land Registry Map of the district that Gantz’s daughter, Sylvia Davidson, showed us. My finger pointing it out to make it even more clear. Sylvia’s parents sound really interesting, I would very much have liked to meet them. He was a geologist working on an oil rig near Guryev for Shell Petroleum before the Russian Revolution. Guryev is on the River Ural before it discharges into the top of the Caspian Sea. He had time off every two months. Her mother, also Swiss, lived in Guryev where she had her children. In order to see her husband she would ride a donkey out to the rig. He had to flee Russia in 1918 when Russia descended into Civil War and lost a great deal of money when the Rouble collapsed. This would be unimaginable for today’s pampered oil workers for international companies with their well paid secure jobs and pay in their home country. 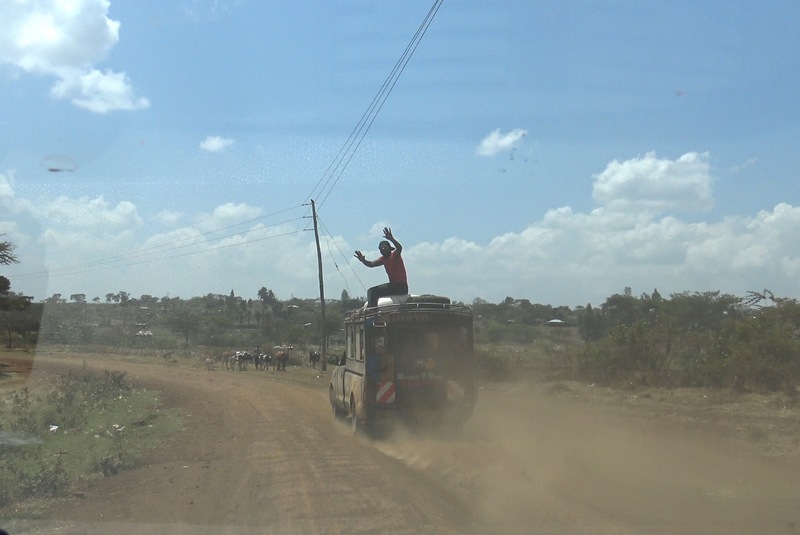 Armed with the GPS coordinates, we set off down the fast-slow shambles of the Kitale-Kisumu road. The fast bit down the new hard top road laid by the Chinese; the slow bit along dirt track beside the roadworks with impatient Mutatu (buses) weaving in from tracks that don’t exist putting bumping red dust everywhere. The new yellow road making equipments and road rollers look and efficient high above us. Modern and mechanised – a different century to the Kenya until now. 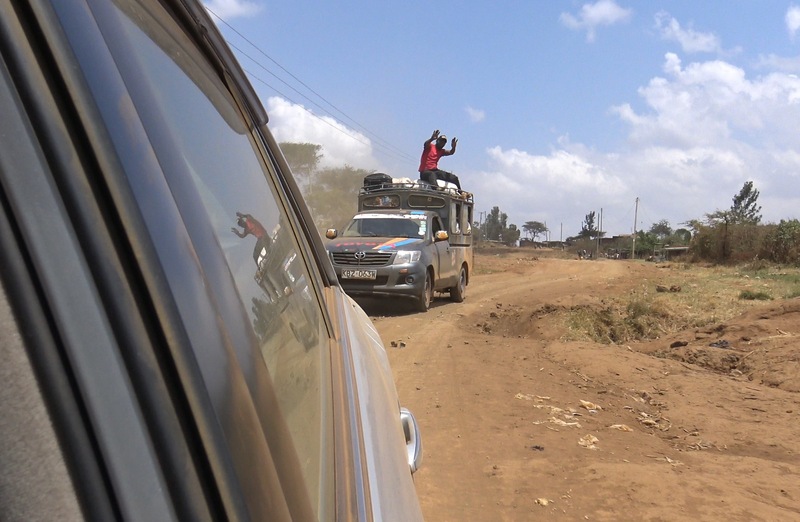 In that Kenya, road repair in the Nairobi outskirts and near Nakuru involved gangs of young people demanding payment from cars driving over ‘their’ rock-filled pothole. Dust hangs on the barbed wire fencing of Kitale Airport and removes the green from the bushes. 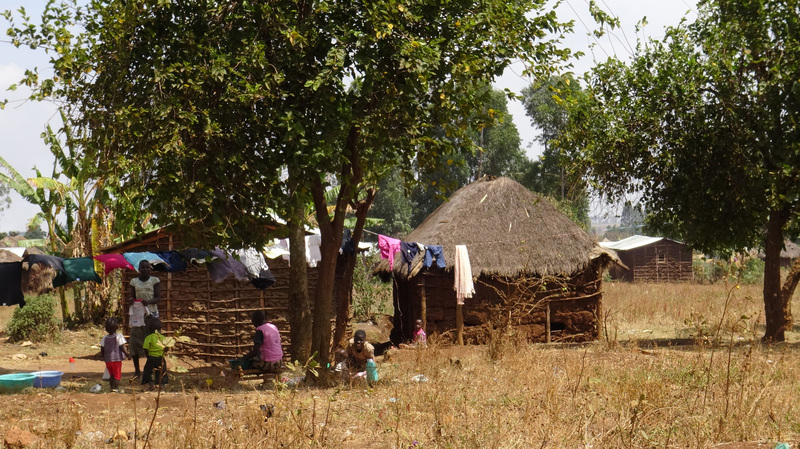 Small, one-story breeze-block buildings contain the hopes and pre-occupations of the Luhya tribe who live here: Schools in abundance – The Repentance & Restoration Kingdom Church, Family Glory Church, The Blessed Meals Church; Schools – Kiminini Girls High School, Muungano High School Emmuels’s Private School (‘Mould a child into a responsible citizen’); two hospitals, finance and technology – Mama Nancy Investment, Mutayi Investments, The Big Vision Shop on one side of the road and The Second Big Vision Shop on the other and STV. After 22 mud-eating miles, the distance given on Emilie may’s sketch map is always in miles, we look for a crossroads, a church or The settler’s Elgon Club in the straggling russet-coloured market in Kiminini – get the stress point right and the name is sayable – but either the new road or the market has obscured them all and we have left Miminini when a red well-graded Murram road comes up on our right, We consult an old man of indeterminate age and wheezy chest, he knows the Elgon Club – “Go back 5 kms,” he says – but the persuasion from the GPS wins. The checkered flag for the Gantz farm waves a few miles up this road – the Elgon Club can wait, we go right. I clear the back seat beside me to find space. The young man has a strong physique, a very long strong neck and a broad, handsome face with a strong equiline nose. His skin is black as satin. He looks around the car and we study each other. He has a wide lovely smile and white even teeth. This man does not look like anyone I’ve met in Kenya yet. He tells me, in English, that his name is John. I ask about his family and he replies in Swahili. The tribal conflict over water in Turkana was bitter enough without the recent oil find adding to the mix. So many have been displaced and so many lives lost. John asks Robert questions about us, Robert, the car, current news. He is interested and he is intelligent. There’s a real niceness and straightforward manner to this man. I feel so sorry for the hand he’s been given. Life without an education is hard enough in modern Kenya with only 1:10 with employment, but without a family to help it is a disaster. Even getting married will be difficult. John directs us back along the main road and then left to the first colonial house. It’s also in the valley and away from the land we think is KK – house or farm, but it’s definitely an old settler bungalow of stone in a large compound. “An old Mzungu called Prisilla lived here,” said Robert translating. It is derelict but was upgraded with 1960’s steel frame windows, a tiled roof and relatively new whitewash. At some time it was wired into the grid for electricity. The new Kenyan owner has built his house of corrugated iron to the side. Upkeep of the bungalow would be too expensive and the style uncomfortable perhaps. We go onto the next house on the other side of the Gantz area and at a five-way junction. The short rocky road tests the saloon car. The house was post Second World War, stone built in the settler style. It is probably a rebuild of an older settler house but the position is not right – it’s on the road, not set back and is in the valley. With great difficulty, removing stones out of the road so the low slung car can turn in eight points, we go on to the third house. The road climbs the ridge above the Gantz area to the north and towards the Kama Koia River. Brilliant! This is the right direction. After 3 or 4 kilometres we come to a gateway and a long avenue of trees climbing the hill to the north. Judging from the line of the avenue, this was a newer road as ‘our’ road bisected the avenue. The trees are old, at least 80 years old as an estimate. I know that Emilie May had an avenue planted, she called them The Coronation Trees to mark the date they went in – but then she wrote that other settlers had avenues too. We go through a gate into a compound with a huge magenta bougainvillea, a large pyramidical Cyprus, an old casuarina. There are views on all sides and excellent farmed land. We’ve been so excited with the discoveries that we find ourselves at a private farm house with SUVs parked. Nothing doing but to get out and excuse our trespass! We park beside a settler-style bungalow in post-World War Two style. A lady is sat at an outside table with a man in his sixties. Six young men looking like farm workers stand nearby leaning on some outhouses. “Come in, come in, we don’t know the word trespass in Africa. All visitors bring blessings.” She said in an Eartha Kitt voice, motioning us through the small garden gate. She stays seated and the man came forward. ‘My PA, Charles,’ she says. The lady is very well dressed – a large worked silver bracelet on her left arm, the latest smart phone in her right hand and a very expensive large gold handbag lies on the bare earth, folded as it fell. Her shoes are lovely, in many colours with a small heel. Long earrings with a turquoise bead and stone with an inset carved swirl completed the waved coiffured hair. It is now late afternoon and cooler so warmth is achieved by a striped cardigan with a beautiful scarf melding turquoise, purple, light blue against a cream background round her neck. “I’m just a simple farmer,” she says. Yea, Right! E She tells us that the farm, plots nos. 5368 & 6932 on the land registry map, is called Machewa Farm after river beside it and that the house has a foundation stone dated 1946. We can see from the Land Registry Map that it borders on the Gantz farm of Kama Koia. Is this the site of KK? It does not seem likely. It’s not on the Kama Koia River, although it does bound the Gantz farmland. We exchange contact numbers and she promises to give me the information of the previous owners. I look her up on the net. The lady was formerly the UN Ambassador for Kenya, the head of Kenyan association of NGOs, a campaigner for women’s rights and a former Miss Kenya. It would be really amazing if it was also the former site of my grandmother’s house. She would approve of this lady. We arrive late back at the Karibuni Lodge at 20:45. Ibrahim has waited for us with our meal. He really is a great cook and this place has been a pleasure to stay in. Today we excluded a lot of potential sites for KK house or farm. Tomorrow we will resume the quest – we’ll find the crossroads at Kiminini and look for the remains of the (overgrown) Elgon Club and the current church (either St John’s Church or built on the site of it at), and then follow Emilie May’s sketch map past the Johnstones’ three farms and on to the Jack acreage. Maybe tomorrow we’ll find KK or the site). Our first morning in Kitale. I resolve to begin my quest for my grandmother in Kitale and find The Kitale Store, in which my grandfather was a major shareholder, and the Kitale Hotel to which HRH The Prince of Wales came to a regimental dinner organised by my grandfather for Armistice Day in November 1928. Ninety years later the population has grown to over 106,000 (2009 census) and burst into shanty to the north and west. We go to see Mahendra, a lovely Indian man of over 70 years old, at Soy’s Mart opposite the law courts – large stone buildings built to impress. They do. We park in covered storm drains and go up two steps into the shady pavement and his duka on the corner of the central connecting road. The store with its concrete well-swept floors and stocked larder staples, wines, spirits and beers could be 50 years ago in Dar-es-Salaam. The smell took me back to my childhood – a mixture of spice and bread and fermenting air decades old. The shop counter of burnished wood is probably original. The only new things are the cash register and Mahendra’s smartphone. I ask Mahendra to orientate me around Kitale. His father opened the first Asian supermarket in Kitale, and he has lived in Kitale all his life, knows everyone and the gossip. The information I want though is nearly 90 years ago and Mahendra is only in his 70’s. He says that the Elgon Club has crumbled and is covered in bushes and that St John’s church, that my grandparents went to, is still there but with another name. We step out from the shady pavement and cross the dusty quiet street. Ndege House is the name of the grey building much in need of whitewashing that is the current occupant of the Kitale Stores site. It houses The Eldoret College Professional Studies and Kenyan Womens Bank ‘Banking On Women’. Across the road, where the Kitale Hotel stood, is now on the edge of a bustling market with vegetables and fruit piled high on pieces of material. Cars, motorbikes and buses edge messily round the people buying, selling and chatting. The remaining part of the hotel is recognisable but decrepit. The Oroko Boulevard Hotel is the faint echo of its elegant ancestor the first floor; The Crossroads Blue Boutique and The Oriental Commercial Bank occupy the ground floor. The orange block has shops downstairs and apartments above. It’s a far cry from the flourish when the hotel opened on 12th August 1927. It’s impossible to see any of this today. 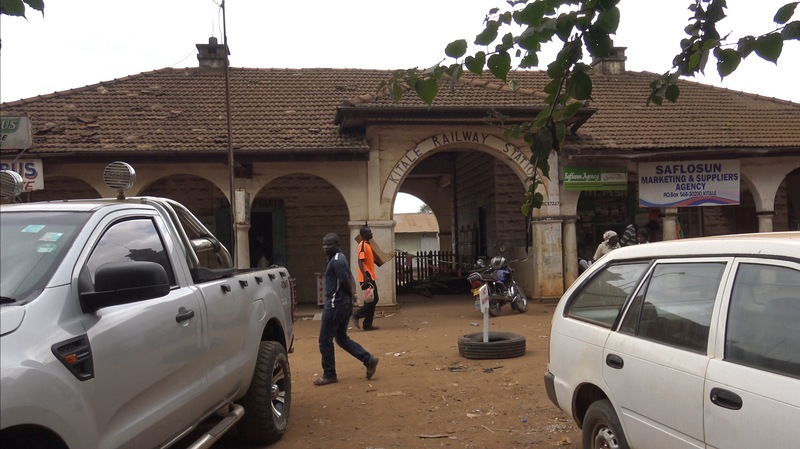 The town planners clean design of the western side of Kitale is under the swamp of the market. Every nook of the western artery road, and onwards, is covered in fruit and vegetables, old shoes, new shoes and flip flops, rucksacks, ladies dresses, men’s trousers – anything sellable is there piled on rickety wooden shelving or laid on mats on the ground. At intervals boda-boda, motorcycle buses, wait for custom, listen to loud African beats. Not many are buying and sellers sleep in the midday sun. Ahead a lorry tries to reverse, its purpose as unclear as its success rate. Luckily we can bump onto the trunk road and escape. These new informal roads have become essential. –> The east side sleeps within the shady confines of the urban plan. Parking is ordered, men sit over chai chatting or reading papers, lawyers discuss with their clients outside the law courts and write letters. The shaded walkways smell of dust, spice and ghostly newspapers rustling for nearly a century. Can these African Rip Van Winkles compete with the new Nakumatt shopping Mall, with its international banks, modern supermarket and clean toilets, that has burst through the urban mould and extended east of the commercial street? –> On the west side the informal market has swamped and covered all the spaces, dukas and roads with mountains of produce and products. The drains are uncleared and rubbish lies decomposing in the tropical heat. Toilets are informal. New tracks and paths weave through former civic green spaces. The pounding African beat sounds lively but I’ll bet the rats are too. Have the city fathers the money, vision or ability to clean the streets and drains, build public conveniences and let the traffic flow? We stop at the small Railway station. It still looks exactly like the 1926 photo on the Internet when it stood on it own at the end of the line with a fence between it and the road. There are no other buildings visible in the photo. The end of the line in a non-descript place? Two years later, in November 1928, HRH The Prince of Wales stayed two nights in a special train for a Regimental Dinner and dance in a marquee set up beside the railway track. My grandfather was the main organiser of the event. Ee Today the town has grown around it – or grown because of it. The station is tiny, a toy station, with a one-storey building on the left housing the Booking Office, now The Matunda Bus Booking Office facing the street, and the waiting room facing the platform. To the right is a cafe with plastic chairs under trees and tentacles from the market are setting up on once green verges. There are two archways – the left one blocked – to the platform. With the trains gone, people have taken the peaceful social space protected by hedging from the main road. Here they chat or sleep among grasses and small flowers in a rare place of calm. 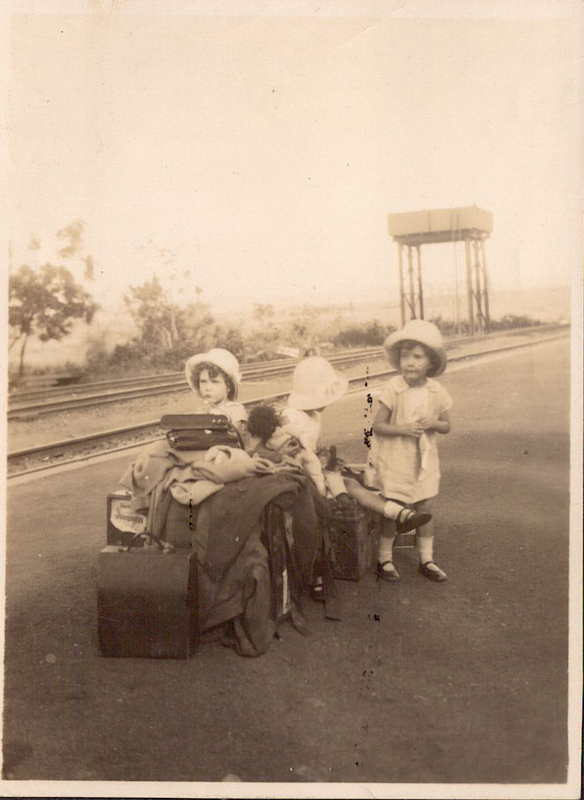 I remember a photo in 193o, there is no-one on the platform but three children on piles of luggage waiting for the train that will take to England. My mother and Valerie facing the camera were 6 years old. Monica looks away — she’s 7 years old. Our final stop is the Museum in its big shabby compound, set back from the main road by a wide sward of bare earth with trees like islands. The Stoneham Museum, now National Museum of Kenya, opened in 1924. Colonel Hugh Stoneham’s collection of insects is still there together with the small public library he founded. Unlike the MacMillan Central library in Nairobi, this library was still relevant for a few and the books are still read although there did not appear to be any new books for quite a few decades. The tiny space is stuffed with back issues of The Daily Nation Newspaper, well-thumbed fiction, Latin and Greek texts, poetry – a large section. The settlers were a well educated lot. Despite energetic efforts of the librarian, there was not much relevant to my quest. I did though find ‘The Red Book 1930 – 1931, Handbook and Directory compiled by the East African Standard’ which gave interesting measurements of the difficulties and scale of colonising Kenya. There were pages on costings for the railway and the difficulties building it (malaria, jiggers, man eating lions at Tsavo, ‘the tsetse flies played havoc amongst the transport animals’ and ‘a disastrous strike of engineering trades in Britain [that] delayed supply of locomotives and wagons’; road building: 1901-1906 511 miles of earth roads, 1907-1914 1479 miles of new road built, 1919-1923 3600 miles of roads built. The book listed plague numbers in Nairobi and elsewhere, post office box numbers of all residents (box number 49. Jack F.C. Listed on page 307); and all the registered clubs and Free Masons Halls – Elgon Club Gentlemen £3 Ladies £1 members 200 established 1924. Muthaiga Club entrance 300/- country membership, 500 members established 1914. 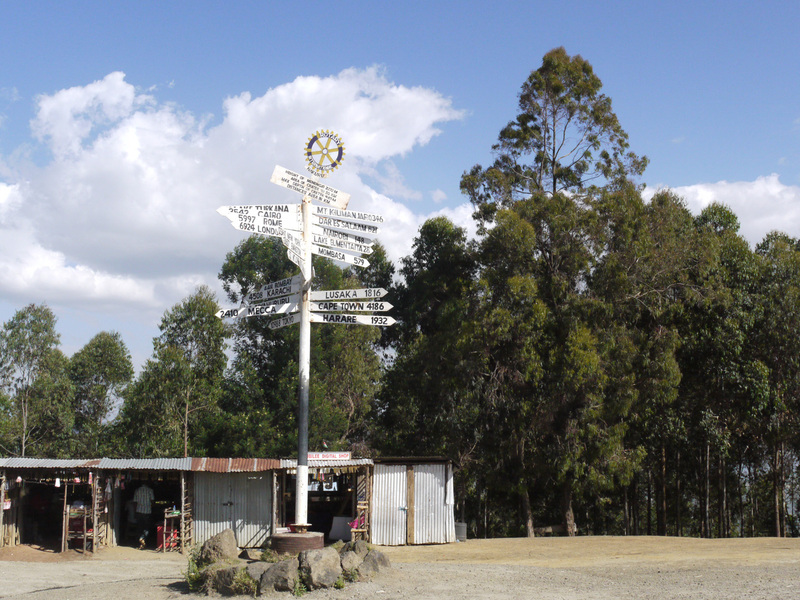 Mt Elgon Masonic Lodge no. 5082 – this established by my grandfather with others. Pages 355-421 list all the expat (white) males registered in Kenya in 1933 – roughly 3,300 which seems low on other measures. Perhaps it didn’t include civil servants, railway workers and The Kings Rifles. It was now 13:00. Time for lunch and the quest to find KK. We set off for Kitale at 9:45. Once out of the town the railway line with a single track dirt road between it and our black hard top road joins us, the same one that has run with us since leaving Nairobi. I know that a graded road was built alongside the railway for the entire length from Nairobi to Lake Victoria and the branch line to Kitale. Is it too fanciful to see my grandfather Fred driving passed us in the Buick with my grandmother, Emilie May, beside him? Salehe, Fred’s longterm manservant, is sat at the back perched on top of their trunks. They are in holiday mood on their way to Nairobi for a week in the Muthaiga Club dancing, playing golf and drinking with friends and probably spent the night at a favourite hotel at Molo. 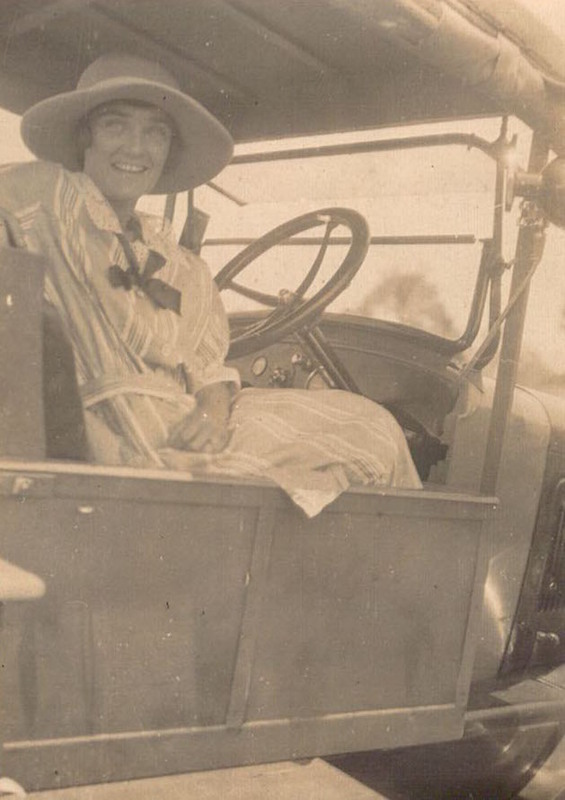 The photo below is of Emilie May in 1924 when she gets her driving license and drives for the first time. Before Molo we go onto a new road built with the help of the African Development Bank and bypass Molo. The road is so new that creepers have not time to heal the wounds so red laterite dirt roads lead from the new road to bomas like slashes up the green hills to thatched mud bomas built in traditional style in well tended shambas. There is a permanence to the landscape now. The villages are painted in green for safaricom, red with Open Happiness for Coca Cola – instantly recognisable branding and a welcome splash of colour. We pass women in Sunday best, one in a bright yellow long dress with a black belt, women carrying babies, women caring bundles of wood on their backs, women in the market selling produce. The men saunter in pairs chatting, unencumbered or sit in groups chatting. Kiosks are now selling honey. The shambas have wide fertile fields growing maize, bananas and cassava. We climb higher, evergreen tress begin to line our road. Sumac and bamboo. Plantations of Eucalyptus for telegraph poles and fencing. The signpost to the right is Londiani, the railhead in 1925 when my grandmother first came here. The railway rejoins our road at Timboroa – according to my great grandfather in his diary, the highest railway station in the Empire. The road goes sharply uphill, on the ‘sleeping policemen’ young men pre carrots, cape gooseberries, onions – clustering so close that we had to nudge them aside. I’m sorry we didn’t buy the cape gooseberries. The plethora of churches do good business on a Sunday: Soul Harvesters Church; Seventh Day Adventists; Kingdom Focus Church; Anglican Church of Kenya ACK for short; The Kingsway Church ‘A church on purpose’; Worldwide Gospel Church ‘An Oasis of Hope’ – women especially walking in, the children outside at Sunday school. At the top of the hill the countryside opens into wide open fertile land, grasslands, plantations of Eucalyptus and woolly hills with bright orange flowers. Combine harvesters and big fields – we’re coming towards Eldoret and there’s certainly money here now as it had in 1925 when Emilie May and Fred came and stayed with Shaw, a solicitor, in his comfortable house with electricity, hot running water and soft beds with expensive linen. Emilie May could not be extracted for three days. This was the same Shaw to whom Fred entrusted his investments, whom he expensively pursued to the English Privy Council – and to whom he expensively lost. It’s amazing to see real pavements, good drainage, houses of more than one storey made of brick and not painted to advertise Safaricom or Coca-Cola. The towns since Nakuru have had no pavements or drainage. The shops are breeze block behind corrugated iron kiosks where small mounds of tomatoes or green oranges lie on crude shelving. There, rough, mean-looking hotels called ‘paradise hotel’ or ‘Blessed Hotel’ between – are these names aspirational? ironic? or betraying no sense of reality? No wonder The Boma hotel has good security — the Sunday lunch is packed with families in Sunday best, small children eating their weight at the buffet, and ladies tucking into chocolate cake and meringue. There’s free wifi and elevators to take well-fed guests to their rooms. Kitale is now 49 miles to the west of us on the road to the northern slopes of Mt. 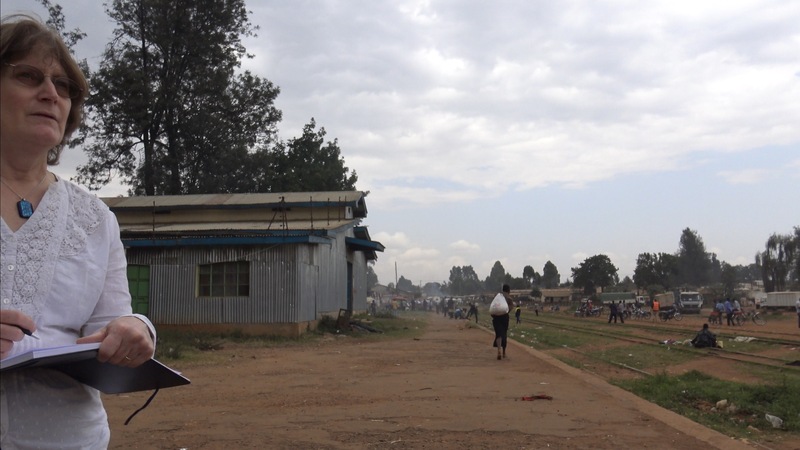 Elgon, Suam and the Ugandan Border. On the map, Kitale hangs contained and parcelled like ripe fruit designed by surveyors with rulers. Two short straight artery roads attach the fruit to the road. There are two parallel main streets: the commercial high street and the physical presence of authority contained in the stone-built law courts and government offices. Three short roads connect the parallel right roads; two on either end and one in the middle. The police lines are behind the law courts. The ordered paper version is very different to the reality of Kitale. The avenue of trees, designed grand entrance into Kitale, is still there but traffic is diverted to a chaos of cars, motorbikes, buses and lorries going east, west and south, to Kisumu, Eldoret, Kitale or beyond, without the benefit of a roundabout – each vehicle launches into the game of chance. After the grand avenue, the road resumes its intended route. It’s a handsome road – wide enough for tuk-tuk or bus to create unintended overtaking lanes without going on the broad grass verges on either side to high hedges and gates. It is very green. To the left, we progress passed the Kitale Academy (now Kitale School), then The Kitale Club and Golf Course and finally the Museum with the Stoneham Library set up by Colonel Stoneham in 19–. On the right are a few stone buildings and a very red, modern Total petrol station – our marker for our lodgings for the night. We turn down a red Murram road into a labyrinth of red streaks laid out on a grid pattern that barricade old bungalows in huge compounds with high hedges. The map from the guest house is hopeless, but the reliable ‘boda-boda’ (motorcycle bus) takes us there for 50/-. It’s an old bungalow with rooms in a big compound. Two children are playing there along with some grazing sheep. Big bougainvillea flowering purple and red form part of the hedge, and yellow weaver birds sing on the hibiscus. I spot a blue agapanthus in the garden – we are meant to be here. We load Philip the guide into the car and drive up the Menengai Crater, actually a shield caldera built up by fluid magma basalt flows. This gives it a flattened undramatic shape, not the classic steep volcano shape. It last erupted a million years ago, but the caldera was formed 2,000,000 years ago. Vital stats for the caldera: 90 square km circumference, 485m to caldera floor, four fumeroles with a measured temperature of 94o C, about 70 lava flows on the ridged caldera floor. It’s one of the best preserved calderas in the world – not that the guide had this information, this comes from John Seach, volcanologist, on the ‘net. The guide took us round the rim away from the carpark and showed us the densely farmed area just out of the caldera. These shambas (African family smallholdings) (he said) were white settler land given as compensation by former Mau Mau fighters to the end of fighting: “Imagine if someone came to your house and stole it from you, would you not fight to get it back?” A reasonable point of view – except the land was originally Maasai land. The white settlers took it, paying the British colonial government for the land under the soldier settlement scheme lottery. According to a long time Kenyan settler whose grandfather bought land in the Cherangani Hills north of Kitale, the Maasai were moved out, causing great deprivation, into the Mau Highlands. When the farms were nationalised, after independence in 1963, the Maasai would not buy back their land and farms, their tradition is pastoral with cattle not farms. The Kikuyu though did have the money and did buy. It is now Kikuyu land. While it is not true that the British paid compensation, or this particular land had been Kikuyu before the white settlers, it is true that the Kikuyu, a people of about one million, had become economically disadvantaged during the colonial times. The guide believed it and maybe it has become the new truth. Researching on the ‘net, consensus appears to be that Nakuru was at the heart of the Mau Mau struggle – both an independence movement and a civil war.. The fighters met in a large cave – said to hold 2000 people – on the eastern side of the Crater. This was a brutal battle in which the Mau fighters murdered hundreds of white settlers and thousands of Kikuyu. The British response was equally barbaric with Mau fighters held in inhumane concentration camps. Neither side held the moral high ground. Today the caves have been cleansed with a new name, The Sacred Caves, and is a popular church. The guide then told us that the guiding fee was just for the information at the rim (and did we want to buy from the tourist kiosks at a better price?) and the walk down was extra! Since he had already told us that normally he would be expected to walk up with tourists, this as a bit of a cheek from a less than impressive guide. We said that we didn’t need him to walk down with us, we would go alone and he said he might as well come with us. It was not a good start to the walk. The caldera has much degraded secondary forest of predominantly eucalyptus, bushes and scrub grow up to its rounded top. Apart from a view of the caldera itself, the only other noteworthy thing was a huge signpost giving distances to London, New York, Cairo and many others. The road goes to the southern rim ending with desultory kiosks selling small things and drinks and a half-built Eco-Lodge and bar. A Danish environmental company planted eucalyptus in collaboration with the National Park. It’s surprising that native trees weren’t planted but presumably they had valid reasons. At first sight, the area was disappointing. Nor was the view what I was expecting although it was big and deep. No one lives in the crater, but an electricity company is drilling 3km into the thermal vents to use the volcanic heat to generate steam for electricity. There were about five drilling platforms there so far and platforms for many more. A small aircraft pilot we met in Kitale said that he has noticed an increase in sulphur in the air when flying over the crater since the holes were drilled. According to Wikipedia, Menengai is two words – ‘Mene’ being ‘corpse’ in the Maa language, and ‘Ngai’ being ‘God’ in Kikuyu. One Maasai legend is that the steam rising from the crater floor are the souls of dead Maasai. The useless Philip said that the Maasai had ‘fought each other to the death or had had accidents or died of negligence’. His version of the meaning of ‘Menegai’ was ‘No God’. It took an hour at the tail end of the afternoon to walk down the mountain to the hotel through scrub, bushes, grass and eucalyptus – a bit like a stroll in the New Forest minus the horses. An aardvark had made deep holes in the path chasing ants but we didn’t see it or any wildlife, just cows, goats and people picking up wood for fires. It was just as well that Philip accompanied as there were lots of different paths including to the Mau Caves some two hours away. We gave him a tip, of course. How much of the information about Masaai, MauMau fighters and the settle out at the end of the colonial period is true? It would take a lot of research to know, we settled for a cold Tusker beer at the hotel in the lovely garden watching iridescent flocks of Starlings, the active orange beak of the East African Thrush pecking at the lawn and Yellow Weavers chattering in the nearby bush.